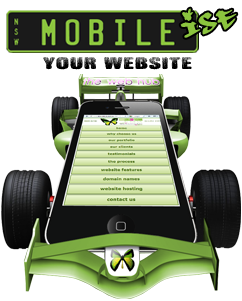 Do you need to Mobilise Your Website?.... Absolutely!. Just having a website is not enough any more. Having a Mobile Friendly Website will make a huge difference to how your potential customers access your business online. Because smart phones and mobile devices have a much smaller screen area, regular websites generally take a long time to load, and when they do, the text is usually very small so your potential new customers will need to pinch and squeeze the screen just to read it. 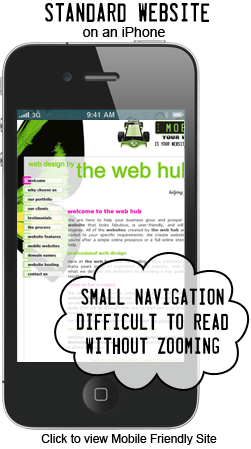 A mobile friendly version of your website is designed specifically to be fast, efficient and affective on smaller mobile devices... without having to scroll and zoom just to read what you are looking for. "Revamping my website and having it adapted to mobile phones with The Web Hub was one of the smartest moves I have made regarding my business. My enquiries and sales have increased and the feedback about how much easier to navigate on mobile phones it is has been great - being one step ahead of my competition is awesome."